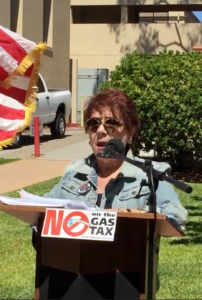 A rally at the San Luis Obispo County Government Center on Monday launched a campaign to repeal increases in the gas tax and vehicle registration fee scheduled to take effect Nov. 1. Andrea Seastrand, president of the Central Coast Taxpayers Association, speaks at a rally in San Luis Obispo on Monday, Aug. 14, 2017, calling for the repeal of increases to California’s gas tax and vehicle license fee. Seastrand said about 80 people attended the rally, representing 12 organizations. The campaign is working to get an initiative on the ballot in November 2018. Gov. Jerry Brown signed a bill in April that will add 12 cents to a gallon of gas and 20 cents for a gallon of diesel. Vehicle fees will increase between $25 and $175 depending on the value of the car or truck. The anticipated $5.2 billion in funds will go to road and bridge repairs and expanded mass transit.